General Murtala Muhammed ruled Nigeria from 1975 until his assassination in 1976. In a short time, his policies, pro-activeness and decisiveness won him broad popular support. He swiftly initiated a comprehensive review of the 3rd National Development Plan and created economic strategies to address rising inflation rate. He also immediately announced that his government would encourage the privatisation of government corporations. To fight corruption and over-bloating of the civil service that was legitimised by the Gowon government, he also dismissed more than 10,000 public officials and employees without benefits, on account of age, health, incompetence, or malpractice. To some, this later became the single biggest policy error in the development of Nigeria by damaging the public service both in capacity and through encouraging corruption. This was because, the dismissals brought public servants to the reality that security of tenure was something that could be swept away with a stroke of the pen. Consequently, since one does not know how long a public service might last, it was considered better to feather the nest while one had the opportunity. In addition, the mass sack had an adverse effect on socio-economic development because Nigeria lost skilled and trained manpower that would have strengthened its institutions. While his critics leverage on this and his role in the civil war in criticizing him; his admirers focus on his personality, decisiveness and the sort of populist actions in took while in few months in office, as part of his legacies. 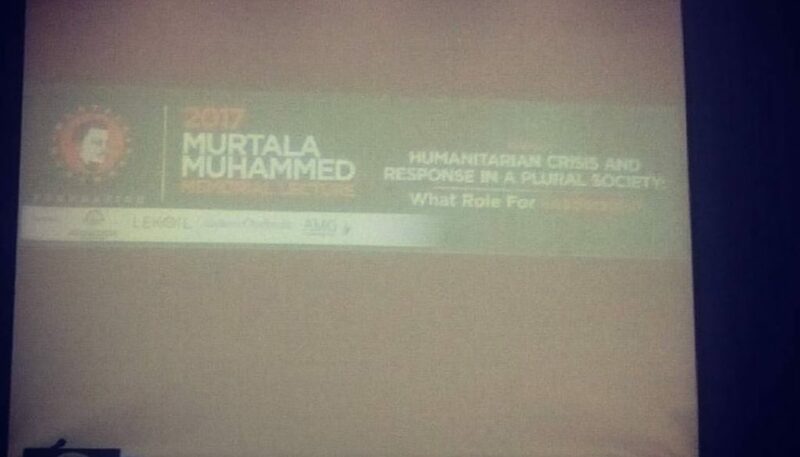 In the midst of such mixed reactions over his legacies, the Murtala Muhammed Foundation (MMF), on 13 February 2017, organized the 2017 Murtala Muhammed Memorial Lecture, with the theme, ‘Humanitarian Crisis and Response in a Plural Society: What Role for Leadership,’ at Shehu Yarádua Centre, Abuja. In attendance were the acting president, Prof Yemi Osinbajo; former president, Chief Olusegun Obasanjo; Cardinal John Onaiyekan; Board Members of MMF; Mrs Ajoke Muhammed, widow of Murtala; and HE Kashim Shettima, governor of Borno State; as well as other dignitaries and participants. The acting and former presidents all gave their remarks, highlighting the ideals of Murtala Muhammed. The governor was the keynote speaker, in a lecture titled, ‘Managing the Boko Haram Crisis in Borno State; Experiences and Lessons for a multi-party, multi-ethnic and multi-religious Nigeria.” In the lecture, Mr Shettima took his time to narrate the emergence of Boko Haram which he married with the incompetence of his predecessor, Ali Modu Sheriff, to settle some disagreements that arose between the police and members of the then budding sect in 2009. However, what was paradoxical was that Mr Shettima was also in the government of his predecessor as a commissioner in 5 different Ministries, and has a great share in any blame with that government, over the latter’s inability to crack this sect while it was budding or harmonise the political instability the disagreements led to. In the lecture, he also went ahead to narrate of how several unnecessary conspiracy theories have been created out of the Boko Haram crisis especially during the immediate past regime, which were not necessary for the unity and development of the country. He commented that such theories prevented the past government from finding immediate measures in rescuing the missing Chibok girls. The lecture also highlighted his disagreements with several NGOs and INGOs involved in managing the humanitarian crisis in the north-eastern part of the country, and a briefing on his efforts on education and agriculture in Borno State. He ended by saying that his government is liaising with other stakeholders to make sure that the IDP camps in the north-east would be closed in May this year. This was another shocking paradox considering that hundreds of thousands of IDPs are all over the sub-region. As at now, the war on Boko Haram just went into a transition of what could be near permanent crackdown on the sect. There is no sort of reconstruction efforts in these communities and the governor wants the IDPs to return to Borno. There are no hospitals, schools; farmlands are devastated; no alternative sources of livelihood. There are no sorts of reconstruction, reintegration and rehabilitation plans on-going. Such mass return by such a deadline that ain’t feasible is not realistic. There should be efforts to make sure IDPs are living fairly well in their camps while the government concentrates on re-building their communities and creating a conducive environment for them, before they return home. Chambers Umezulike is a Program Officer at Connected Development and a Development Expert. He spends most of his time writing and choreographing researches on good and economic governance. He tweets via @Prof_Umezulike.